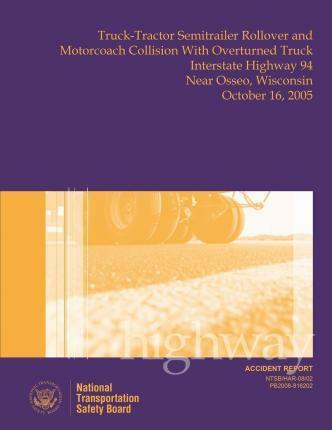 On October 16, 2005, an accident comprising two events occurred on Interstate Highway 94 (I-94) near Osseo, Wisconsin. The first event was the rollover of a truck-tractor semitrailer combination unit. The second event occurred when a motorcoach collided with the wreckage from the first event. About 7:30 p.m. on October 15, 2005, a truck driver departed Munster, Indiana, on a trip to Minneapolis, Minnesota, driving a truck-tractor semitrailer operated by Whole Foods Market, Inc. At 1:58 a.m., the combination unit was traveling westbound on I-94 near milepost 85, when it departed the right-hand travel lane and paved shoulder.